Alien Motel | A resource that presents evidence of aliens, and extraterrestrials from Area 51, UFO's, to paranormal. A resource that presents evidence of aliens, and extraterrestrials from Area 51, UFO's, to paranormal. Here we have some evidence of the past and present of alien civilizations. Some of which has been disproven and others that have yet to be explained. 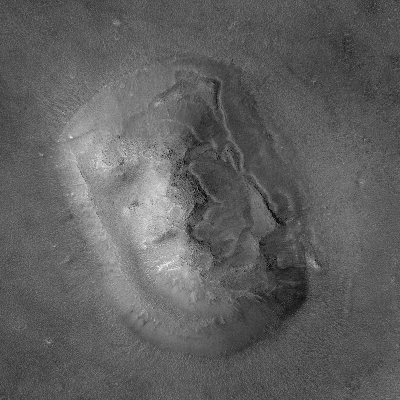 The face on mars myth: It was not long ago that humans discovered something on the surface of Mars that seemingly resembled a face. People quickly interpreted this new found structure as evidence of the existence of aliens and the possibility of a civilization. However, it was later disproven as just an optical illusion created from a rock formation. The evidence to disprove this anomaly came just as soon as scientists were bel to get a clearer higher resolution picture of the surface of the planet. Below are the images of the face on Mars taken by Nasa. The Left picture shows the original photo taken in 1976, the right side shows the most enhanced image of the rock formation taken in 2001. This next picture is an enlarged version of the clear and enhanced photograph of the Mars face.